The summer music festival outlook just got a bit clearer, as Bumbershoot, Counter.Point, Pygmalion, and CBGB are among the latest events to unveil their lineups. The forecast calls for plenty of Skrillex, but art-rockers Grizzly Bear will also be making a stateside return, while M83, Cloud Nothings, and plenty of others are scheduled for multiple appearances. As Seattle Weekly reports, Bumbershoot returns to the Seattle Center on the Sept. 1-3 Labor Day weekend. Jane’s Addiction, Tony Bennett, Skrillex, M83, Mac Miller, and Big Sean are among this year’s headliners. Other standouts on the bill include Passion Pit, the Pains of Being Pure at Heart, the Vaselines, Low, Mudhoney, Wanda Jackson & the Dusty 45’s, M. Ward, Yelawolf, and the reunited Promise Ring. Tickets are available at Bumbershoot’s website. Atlanta’s inaugural Counter.Point Music Festival takes place September 28-29, and the just-announced lineup takes a more electronic bent. 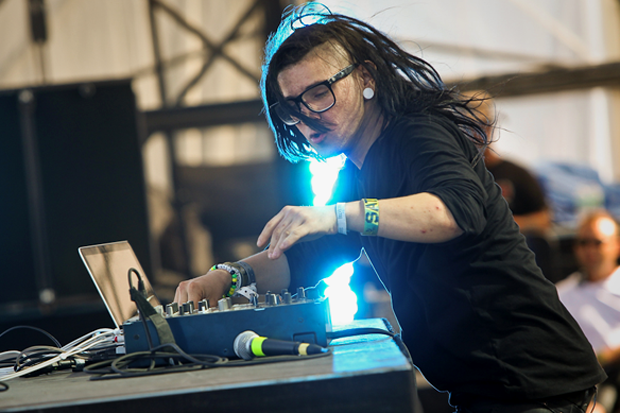 Bassnectar, Skrillex, Pretty Lights, and Avicii are among the bold-face names, while other highlights include M83, Crystal Castles, Big Boi, A-Trak, Toro Y Moi, Washed Out, Zedd, Polica, and Theophilus London. Head to Counter.Point’s website for tickets and other information. The Pygmalion Music Festival will hold its eighth annual event September 27-29 in Urbana-Champaign, Illinois. As Consequence of Sound points out, the recently announced initial lineup includes Grizzly Bear’s first slated U.S. gig in almost two years. Dinosaur Jr., Cloud Nothings, Tennis, Lotus Plaza, Willis Earl Beal, Frankie Rose, Big Freedia, Julia Holter, and more are also set to perform, with headliners and other additional acts still to be named. Pygmalion’s website has more. Also just announced is the first annual CBGB Festival, set for July 5-8 in various New York City venues. As the New York Times reports, the musical segment of the event will feature 300 bands in 30 locations. Guided By Voices, Cloud Nothings, and the Pains of Being Pure at Heart are set to play a free show in Central Park, while other noteworthy acts include the New York Dolls’ David Johansen, the Hold Steady’s Craig Finn, and the Cro-Mags. This festival, too, boasts an informative website.